Choosing Joy: Happy Birthday to me and a giveaway! I'm a bit of a birthday snob... I love my birthday. Finally got to put the birthday cake up on my Happy Everything Platter... love it! I had a great birthday celebration last night. Bryan took me to my favorite restaurant and when I walked in I saw some of our friends. Now, let me preface this with we live in a small town and it is not at all unusual for us to see our friends places... and actually I feel like we run into these friends A LOT on accident. So I said hi and went to check us in... well come to find out B had surprised me with a birthday dinner with our friends and I had no idea... I'm a little oblivious! He is taking me to see Taylor Swift in October! I am ecstatic! Best birthday present ever!!! This morning I am blogging... baking Hudson's birthday cake for our joint birthday party tomorrow. I usually don't like sharing my birthday but I actually am more excited about his birthday next week than my own. Looking yummy already, I'll post the recipe soon! My friend Shawnda is a Scentsy consultant and she has graciously offered to do a giveaway! She is giving away a Scentsy plug in, scentsy circle, bar, and scent pak! I wanted to share the love on my birthday so I decided to break this giveaway up so that there would be TWO winners. 1. Follow my blog and put me on your blog roll if you have one. 2. Check out Shawnda's Scentsy site and comment telling me your favorite product. 3. Buy a product from Shawnda for an extra 3 entries! Leave a comment after you have made a purchase. 4. Tweet about this giveaway... leave a comment with your twitter ID when you tweet. 6. Blog about this giveaway. Please leave your blog URL of the post. The person with the MOST entries will win the plug in warmer and scent bar. I will personally check them out to make sure they are legit. If there is a tie I will use random number generator to chose between the tie. For the Scent circle and scent pak, I will use random number generator between all of the entries (even those with the most, so potentially they could win twice). So enter for your chance to win NOW (Sept 2, 2011) through my sweet baby boy's birthday (Sept 9, 2011). I will draw a winner on Saturday, September 10. I'm a follower! (But don't have a Blog Roll up on my site - should I create one? Please let me know at samantha.a.schultz@gmail.com) Thanks! I *love* the full size warmers and am really trying to find the perfect pattern I want! checked out her site and my favorite is the premium full size warmer-cherry blossoms. LOVE IT!! So cute!! I love the Boleyn Scentsy warmer!! My favorite Scentsy thing is the Arkansas Razorback warmer...or the scentsy buddies! I follow on GFC as krispycrackers~! 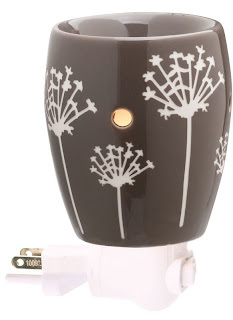 I LOVE the Fossil Fern warmer~! Shared on Facebook as Sam Buck~! Happy birthday! I love the full size warmers!